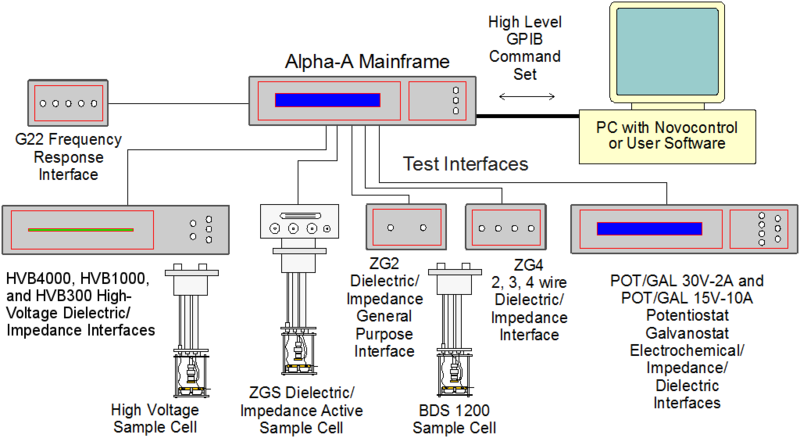 Test interfaces extend the functionality of the Alpha-A modular measurement system. 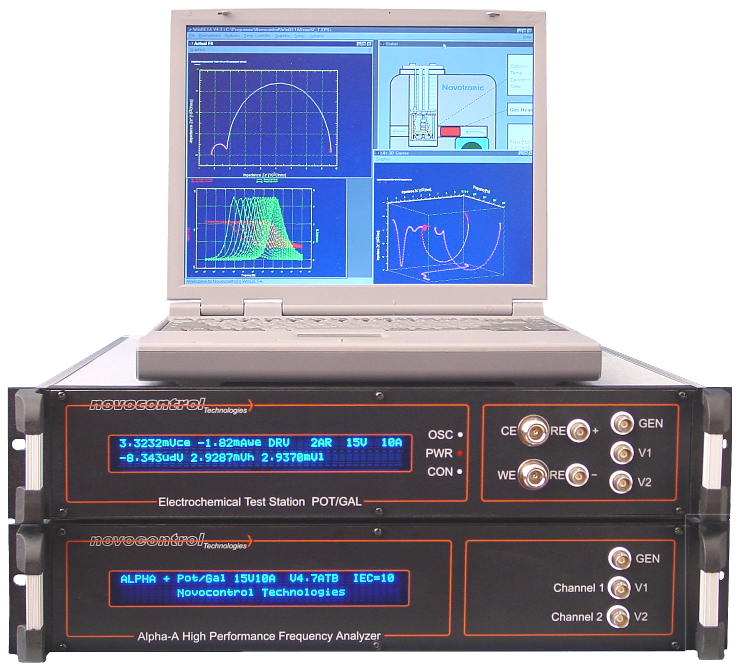 For dielectric, conductivity or impedance measurements, the Alpha-A mainframe has to be combined with at least one additional test interface. All test interfaces are are connected to the mainframe by an internal digital and power supply bus. The mainframe automatically detects the connected test interface and adjusts its functionality accordingly. 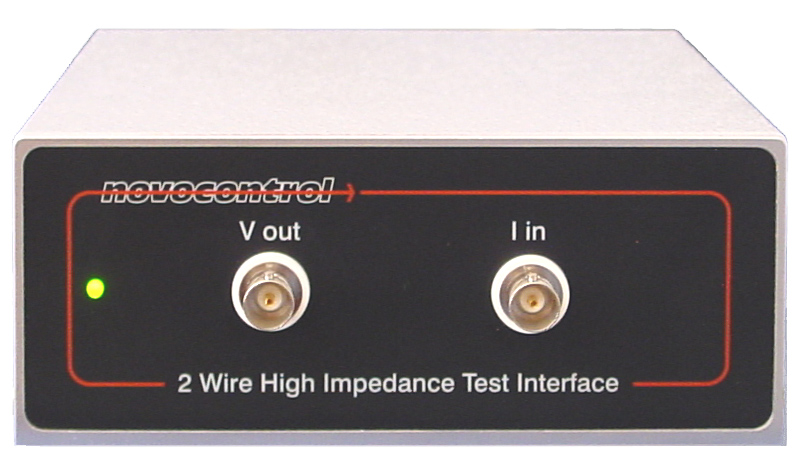 All test interfaces except G22 support automatic reference capacitor measurements and are suited for both dielectric and conductive samples but optimized for special applications. The Alpha-A mainframe standalone and all interfaces except HVB support two channel high accuracy frequency response or gain phase measurements. 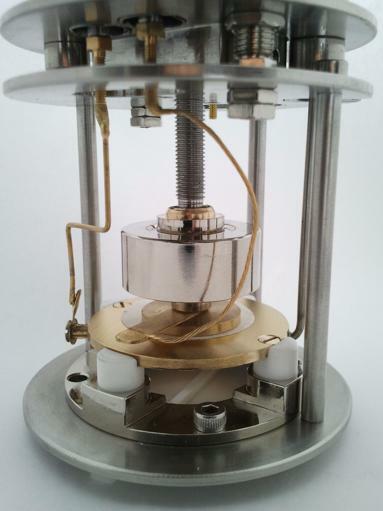 ZGS general purpose interface for two-electrode measurements. 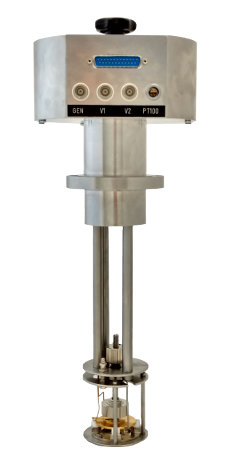 ZGS has the same functionality as ZG2 but is integrated in an active parallel plate sample cell for usage with Novocontrol temperature control systems. Especially recommended for dielectric or conductive samples which can be prepared between parallel plate electrodes like e.g. polymers, semiconductors, glasses, and liquids or powders with not to high ion conductivity (electrode polarization). Most accurate and straightforward solution for parallel plate electrode configurations. Specification applies at the cell electrodes position. ZG2 general purpose interface for two-wire measurements of dielectric or conductive material samples in combinations with the Novocontrol BDS 1200 passive parallel plate sample cell or customer made sample cells and electronic components. ZG4 general purpose interface with same functionality as ZG2. 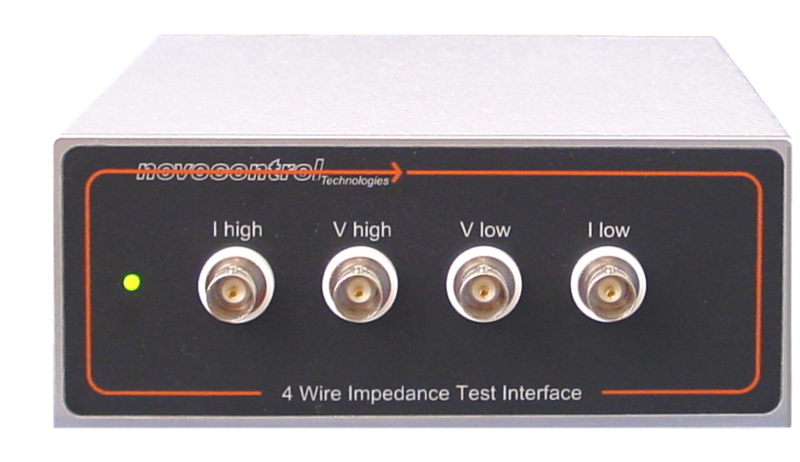 In addition 3 and 4 wire measurements with high impedance 1 TΩ | 10 pF differential voltage inputs are supported. low impedance samples below 1 Ω like e.g. strong electrolytes, heavily doped semiconductors, metals, superconductors. 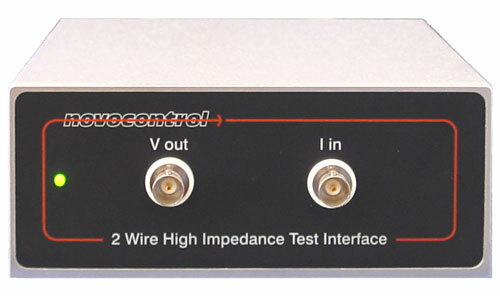 HVB 300, HVB 1000 and HVB 4000 high voltage interfaces for dc and / or ac voltage amplitudes of ±150 Vp, ±500 Vp, and ±2000 Vp, respectively. 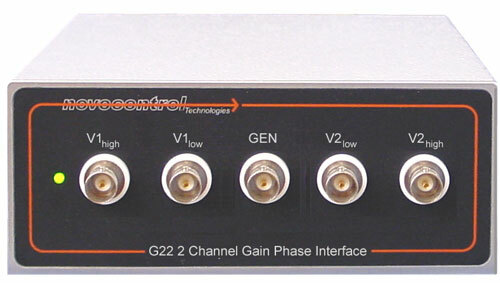 G22 general purpose interface for high accuracy frequency response and gain phase measurements. Measures the amplitudes and phase shift V1high-V1low and V2high-V2low of two voltage channels. 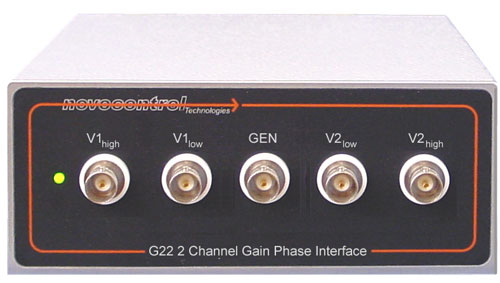 Similar functionality to a double input channel lock-in amplifier with improved accuracy. 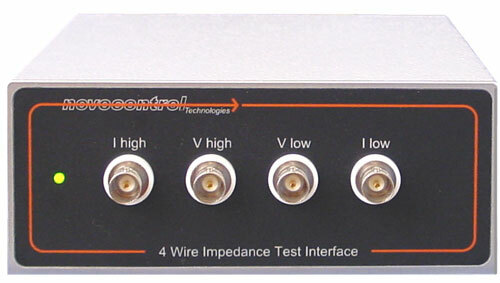 Can not be used for impedance measurements of components or materials.